On First Take Fridays a number of authors around Meeple Mountain give short first takes on games that are new to us. This week we have takes on Paper Tales, Keythedral, Teotihuacan: City of Gods, and AuZtralia. I have to begin by mentioning the artwork in Paper Tales. The box art is lovely, but it doesn’t quite prepare you for the fascinating layered art on the cards. Each image looks like it was created using coloured pieces of paper or felt, cut out and laid on top of each other. This adds such a unique texture and depth to each card that I have yet to see in any other game. 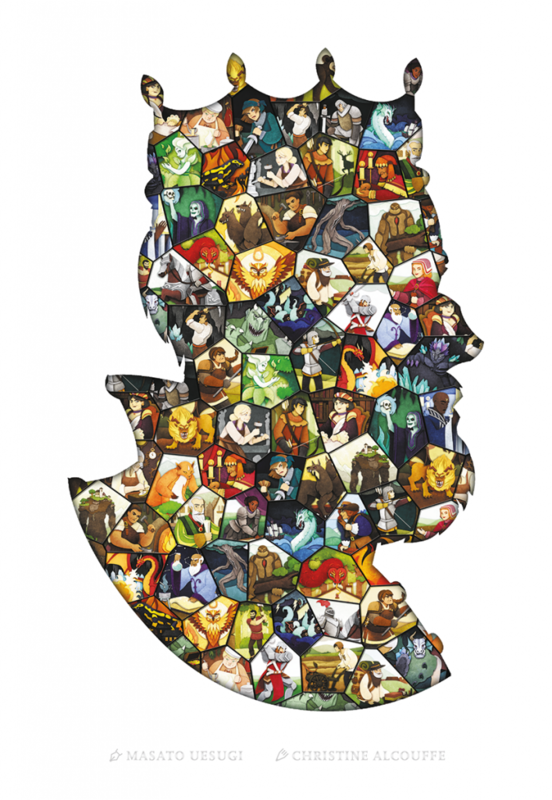 Paper Tales is a card drafting game where players are building up a village, recreating a legend, or telling a story. Honestly, I’m still unclear on what the theme actually is so I’ll just say you are drafting helpful characters and constructing buildings. These recruited characters could score players points during the war phase, earn income, or provide resources needed for building. Recruited characters will also age at the end of every round. Aging works like this: any characters without an age token (which I thought looked like mold) receive one, but if there is already an age token on a character, then they will die and be removed from your tableau. I especially liked the aging phase because it meant that no player was able to keep their card synergy for more than 2 rounds. It forced you to consider whether an expensive character was worth their recruitment cost and which characters you needed in your tableau at the same time to build or score points. Like many drafting games, familiarity with the cards plays an important role in strategy and Paper Tales is no exception. Late into our first game, I realized the benefit of some of the earlier cards I had haphazardly discarded and I noted how I could improved in my second play of the game. Hopefully that will come soon! Keythedral has been sitting on my shelf eyeing me for quite awhile now. I love Richard Breese so when I saw this rare gem pop up on an auction not too long ago, I pounced on it like a hero on a live grenade. This past weekend, I finally got a chance to play it. The box says that the game is designed for 3 to 5 players. However, there is a 2 player variant in the back of the rulebook and this is the variant that I played. The game revolves around a series of hexagonal tiles that the players take turns placing into a random arrangement on the table and the little numbered cottage tiles that the players place in between them. Next to this is the titular Keythedral board that has several rows of seats. The bottom row of seats are worth 1 point each. The second row is worth 2 each, etc. The players are competing for these seats because it is the points provided by these seats that will determine the ultimate winner of the game. At the bottom of the Keythedral board are 5 spots numbered 1 to 5. Also provided are 5 wooden cylinders that are stickered from 1st to 5th. On a player’s turn, they will pick up one of these cylinders and place it onto one of the numbered spaces. If they pick up the 1st cylinder and place it onto the number 4, for instance, this will dictate that each of the cottage tiles with the number 4 on them may perform an action. In turn order, players will place a worker from their supply onto one of the tiles bordering their number 4 cottage and then collect the resource that tile would produce. Then the next cylinder is placed and the cycle continues until all cylinders have been placed and all resources collected. Then the players will have the opportunity to purchase things such as the Keythedral seats needed for them to score VP or cottage upgrades which allow them to place more workers at a time (and thereby collect more resources at a time). Play continues until the last seat has been purchased. Then the points from the collected seats are tallied and then person with the highest score wins. I’m a huge fan of Richard Breese, so I was excited to finally have an opportunity to play this game. When it was all over, though, I wasn’t sure how I felt about it. Don’t get me wrong. 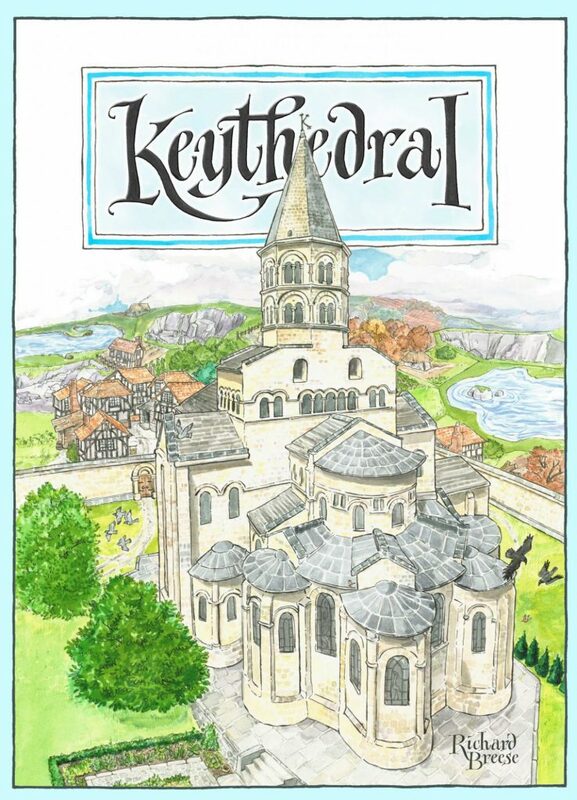 Keythedral is a very solid game and it works very well, but it definitely felt a little more cutthroat and in your face than most of his other games. There was also a lot more luck involved in this game than in many of his later titles. This luck comes in the form of Law cards – many of which are “take that” cards which, when revealed, will invariably screw the opponent over in some way. In a two player game, this feels pretty targeted and mean. While I liked the game, something about it just felt a bit off and I suspect that was largely due to only having two players. I’d have to play it again with more people before I can pass final judgment on it… a proposition which excites me! 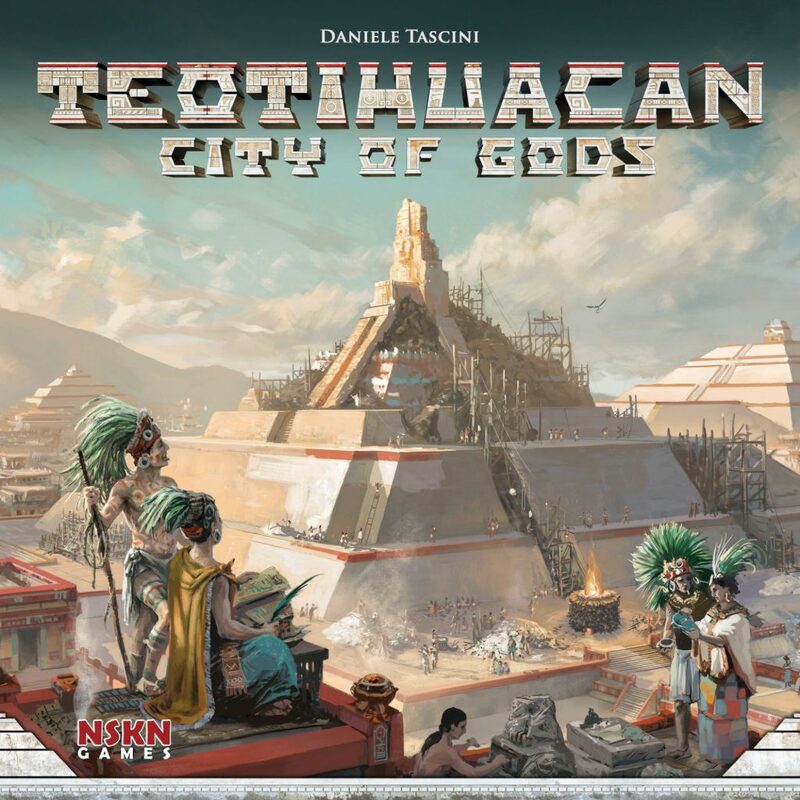 Teotihuacan: City of Gods is the much anticipated new game from designer Daniele Tascini of Tzolk’in: The Mayan Calendar fame with a solo mode designed by David Turczi (Anachrony). This was a title I have anticipated for a number of months. Like everyone else who enjoyed Tzolk’in, I wondered how it would live up to its older sibling. Teotihuacan is a rondel-driven work placement game where your workers are represented by dice which raise in pip-value after completing actions. The power of your action is determined by the number of dice you have present on a space and the value of your lowest pip die. Each worker placement space is very simple and not unlike what you expect in a worker placement game. About half of the spaces are for gathering resources, the other half for turning them into points. The interest comes in the challenge of managing the ebb and flow of your workers to maximize the power of your actions. Additionally, you have the option of locking up dice for special worship actions available at each location, which can be powerful but tie-up your worker resources. It’s incredibly difficult to talk about Teotihuacan without a comparison to Tzolk’in. Other than the ancient civilization theme and a few familiar board structures (like worship tracks) this game feels little like Tzolk’in. It does feel a similar weight to some of Tascini’s other titles like Tzolk’in and The Voyages of Marco Polo. Teotihuacan seems to present a bit less tension than Tzolk’in did; if you did not like the lack of control you felt in Tzolk’in but otherwise enjoyed it you will likely enjoy this game. That’s where I will stop my comparison. Teotihuacan is a solid medium-heavy weight eurogame with a puzzle-like point-salad feel. It has great components and looks fantastic on the table (though I will warn the board eats up a lot of table space). It feels like a fairly straightforward puzzle with the added obstacles of managing the worker strength and location along with a layer of interest in coordination of movement. I look forward to exploring the puzzle in future plays and very much anticipate my next play! AuZtralia is a game about venturing into the heart of 1930’s, alternate-history Australia to claim riches and glory. During the game 1-4 players develop train routes, build farms, mine for resources, hire notable characters… oh, and build armies of armoured trains, artillery cannons and attack zeppelins. You see, there’s more to AuZtralia then just swanning around the outback: a horde of terrifying Old Ones has been disturbed by your activities and want to put a stop to them and you. 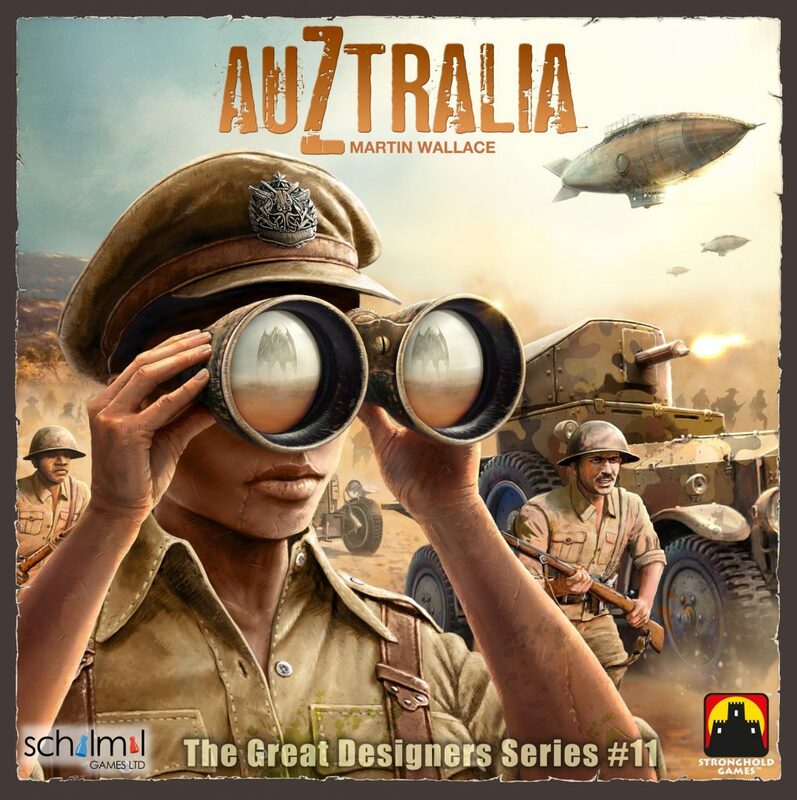 AuZtralia was funded on Kickstarter in early 2018, persuading me with the intriguing thematic mashup, the gorgeous artwork and the designer Martin Wallace’s impressive pedigree. I’ll admit that some buyers regret set in during the intervening months but I needn’t have worried. In our first game my wife and I quickly built into the interior of Eastern Australia and mined as much phosphate (good for end-game points but otherwise useless) as possible. Around the 15 minute mark Lisa bought a single zeppelin and, with a characteristic ‘go big or go home’ attitude, proceeded to attack a Level 3 Old One which was revealed to be Cthulhu itself. Needless to say, the unknowable monstrosity razed Lisa’s farms to the ground before destroying her port and ending the game. The fight was surprisingly close but the game was not. Read more from Andrew Holmes. Previous postThe Board Game Soapbox: Give Us Baggies or Give Us Death!